Wow, we are already into the second month of this school year and I am not sure I really know my students very well yet. I have a working idea of who they are as students and as people but need to gather more information to help me with my programming. That is where using their Ontario Student Record (OSR) can help you gather further data to assist me in this process. I typically do not complete my OSR searches until after the first month of school so that I can establish my own opinion about them as learners. The OSR is a cumulative record of them as a student since their entry into the Ontario education system. 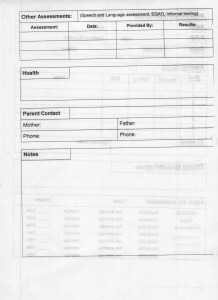 It is a legal document that travels with them from community to community and school to school in Ontario. It is a valuable tool for any educator who is working with a student. There is a wide variety of information that exists in a student’s Ontario Student Record. First and foremost are the provincial report cards from their time at school. 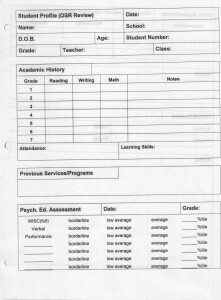 It is here that a teacher can gauge where a student has typically performed in the various curriculae. In addition there is often a wide variety of other sources of information specific to that student. For example, there could be documentation around outside supports such as occupational therapy, early intervention, psychological assessments, legal documentation around custody, Family & Children Services involvement, suspensions, Individual Education Plans and Safety Plans. When you look at the back of the OSR you can see a history of whether a student has had a stable education in one school or whether their circumstances show multiple schools with little or no stability. I have had one student who was entering into his 8th school and he was only in Grade 4. There is a combination of hard data as well as data that has a subjective component and is based on the interaction and opinions of adults. It is important to differentiate between the two. I am not saying you should discount in any way or ignore that data, but rather understand that the circumstances in which that data was obtained may have been affected by many outside factors. For the student who was entering into his 8th school, his OSR showed that he had difficulty making friends. That data was accurate but was also impacted by his inability to be in a single place long enough to establish friendships or the fact he knew if he did make friends, he would probably be moving soon. The OSR search is most valuable to me for my at risk students. Students who I know come with challenges either from an academic or behavioural standpoint are the first ones I search, as they demand my attention immediately. When I have a firm understanding of what level of achievement my students are displaying I then look at previous report cards to help me. If for example a student is obtaining a lower mark in mathematics then what has been previously reported it prompts me to further examine my assessment data to ensure my determinations are aligned with my criteria. It is important to familiarize yourself with the proper protocol of what goes in an OSR, who can access an OSR, where that OSR can be viewed and the responsibilities a teacher has in regards to filing information in a student’s Ontario Student Record. A really rewarding aspect of doing my OSR searches is that I get to see how they have changed over the years with their annual photo. I have attached a template that I use when completing an OSR search.